Eclipse Magnetics has supplied TRP Sealing Systems Ltd with a bespoke Power Matrix heavy duty workholding system to aid it in its new venture to manufacture and refurbish mould tools in house. TRP has invested in the first and largest Wele Large Bridge machining centre in the UK from 2D CNC Machinery for this project. TRP Sealing Systems Ltd had no doubt that magnetic workholding was the key to the success of its purpose-refurbished tool room. The requirement from Eclipse Magnetics was to provide an effective method of securing both the large steel plates and existing moulds in a known and repeatable position for manufacture and refurbishment. The moulds are manufactured of good quality steel plate and range in thickness from between 16mm to 30mm. Plate dimensions range from 860mm by 830mm up to a massive 3,900mm by 1,750mm. The key to manufacture is to ensure that the plates are held flat during machining so that the back face to mould profile is totally parallel, and also to provide clearance for back chamfering. Eclipse Magnetics provided the perfect solution in the form of the Power Matrix Permanent Electro Magnetic Chuck – a magnet bed supplied in 14 sections. 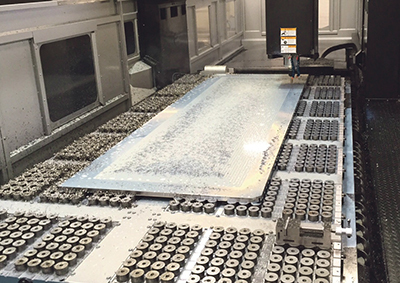 The overall size of the Power Matrix Milling system is 4,000mm x 2,000mm x 66mm high and the system includes controls for selectable zones. It allows 5 side access to the workpiece, as well as consistent, uniform clamping provided by high intensity neodymium magnets over the entire workpiece.